Marko Ramius is captain of the Soviet Union's newest ballistic missile submarine, the Red October, equipped with a revolutionary silent propulsion system known as the Caterpillar Drive. At the start of the movie, he is shown taking the boat out to sea, ostensibly for its first exercise with other units of the Russian Fleet. The captain, however, has another plan—to navigate the submarine to the coast of America in order to defect. To achieve this, he must murder his political officer, who, alone amongst his officers, was not hand-picked in support of this action. After this is done, he reads substitute orders to his crew to support the mission, and begins his long journey. He is, at first, discovered and tracked by the USS Dallas, an American attack submarine, but upon activation of the Caterpillar Drive he is able to break away. Meanwhile, Soviet authorities read a letter posted by Ramius prior to his departure, announcing his intention to defect. The Soviet Navy immediately puts to sea to locate and sink the Red October. This causes a stir in Washington DC. when the activity triggers a reciprocal deployment of U.S. assets as Russian intentions are unclear. At this point a CIA analyst named Jack Ryan, who had been researching the submarine as a project, puts forth the proposition that Ramius may be defecting with the Red October. The President's NS advisor, Jeffrey Pelt, suggests that Ryan go to the North Atlantic Fleet and somehow make contact with the submarine before the U.S. is forced to sink it as a rogue threat. 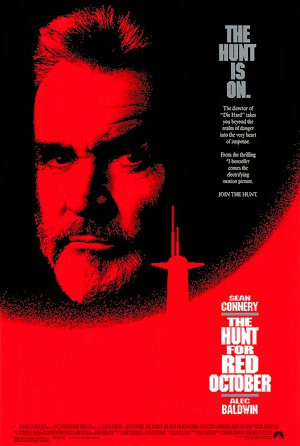 At various points throughout the film, Pelt is conversing with the Soviet ambassador, who first requests American assistance to locate the Red October, and then to sink Red October, falsely claiming that Ramius' letter declared his intention to attack the United States on his own authority. Meanwhile, Ryan, who has arrived on a US Navy aircraft carrier in the North Atlantic, is greeted with less than enthusiasm by the ship's captain at least partly because, as a civilian, he is wearing a naval officer's uniform (at the request of the CIA director). The naval task force commander overrides the captain's objections, remarking that Ryan had been a Marine officer and a Naval Academy graduate before service-related injuries forced his medical retirement. Acceding to Ryan's request to be delivered to the attack submarine USS Dallas, which has been tracking the submarine, they put him on a helicopter which takes him to its location. After surviving both an attack from Soviet Naval Aviation and an onboard saboteur, the Red October passes through an underwater route, where the USS Dallas, through the efforts of a diligent SONAR operator, Ronald "Jonesey" Jones, locates it again. The arrival of Ryan forces them to break contact with the sub, whose officers have meanwhile deduced that the Dallas had indeed found the characteristic signature of the Red October's drive, and was able to locate her. Ryan convinces the Captain of the Dallas, Bart Mancuso, to make contact with the Red October to facilitate the defection. The plan goes as follows: Ramius stages a false reactor overload to force the vessel to surface and as Red October surfaces it is confronted by a frigate, and sent a morse-code message via signal lamp not to submerge, or be fired upon. Ramius keeps only the officers loyal to him on Red October, and orders the rest of the crew off. Claiming that he and the officers are going to scuttle the ship, rather than let it fall into the hands of the US. Consistent with the charade, a Seahawk helicopter launched from the frigate fires a torpedo towards the Red October, but Admiral Greer detonates the torpedo before it hits the submarine. Ryan and several Dallas crew members, including Captain Mancuso and Jonesey, travel to the Red October via a DSRV and offer any support they can provide. Once Ramius realizes that he can trust them, he formally requests asylum to the United States of America, which Mancuso grants. All goes well until Soviet torpedoes are heard in the water, from the Soviet attack submarine V.K. Konavalov that has also found the Red October. After the first torpedo is fired upon the Red October, Ramius orders Ryan to steer the ship directly into the torpedo's path. Everyone else insists that Ryan not do so, but Ryan reluctantly complies. When the torpedo hits the hull, it breaks apart without detonating, and it is finally realized on both sides that the maneuver was a tactic to close the gap before the torpedo had a chance to arm. A second Russian torpedo is fired, this time with all safety mechanisms deactivated so that the torpedo is armed right at launch. Concurrently, the saboteur planted by the KGB, an enlisted member of the crew, ostensibly a cook, reveals himself by shooting at the captain, wounding him and killing the executive officer, Vasily Borodin. Ryan and Ramius go after the cook, while Mancuso takes command of the Red October to deal with the external threat. Ryan kills the cook, and the Konovalov is destroyed by its own torpedo after a series of maneuvers by Mancuso commanding the Red October, and the Dallas, still in the area. Ultimately the submarine finds haven in the Penobscot River in Maine, and Ryan flies home with a teddy that he had promised for his daughter.